During the late 1960’s, a Soviet scientist named U. I. Ivanov performed and published results from an interesting experiment. Ivanov used three similar groups of people and had them perform strength training exercises twice a week for a period of three months. Group 3 performed yielding (eccentric) exercises using weights exceeding 10-40% of what they were capable of lifting in an ordinary (concentric) manner. Group 1 managed to lift on average 8.5 kg more in the squat and 5.5 kg more in the clean. They also managed to jump 3.7 cm higher and could pull with 14.6 kg more force in a back strength test. Group 2 managed to lift on average 9.2 kg more in the squat and 12.7 kg more in the clean. They also managed to jump 5.4 cm lower than before the training period and pulled with 30.0 kg of increased force in a back strength test. Group 3 managed to lift on average 15.0 kg more in the squat and 9.7 kg more in the clean. They also managed to jump 1.6 cm lower than before the training period and pulled with 19.1 kg more force in a back strength test. What did and does this experiment reveal? The athletes tested strongest in the motor skills and tasks that were the most similar to the exercises they did in the experiment. On the one hand, the specificity of the training produced the highest results in the motor tasks and exercises most similar to the ones performed. On the other hand, if those same athletes would have continued using the same exercises for an extended period of time they would have ceased to progress any further. This is called Accommodation. Accommodation is a biological law that states that a decrease in adaptation will occur to a repeated stimulus over an extended period of time. In other word, your progress will stop. Every activity you do has a learning lifecycle to it. Let me provide an example. When you were a small child, you probably read kids’ books (maybe you still do). Simple stories, learning the alphabet and learning your times table were likely things you did. At an early stage of learning when these processes are not fully comprehended the brain is greatly stimulated. Fast forward 20 years. You have left school and you are working as an accountant. Would you still be using such books to learn how to be a good accountant? I sincerely hope not! Your brain has exceeded the capacity to learn any more from such elementary activities. What you need is increasingly more complex demands to keep progressing. If you were to return to elementary teachings you most definitely would not be progressing in your accountancy job for long! Believe it or not, strength and speed adapt in a similar way. I’m sure you are aware or have seen people in the gym making rapid progress in the early stages of training only to hit a brick wall due to using the same routines. You have likely experienced it yourself. Most definitely I have. Exercises in the 3 categories above all have slight variations in movement, speed and intensity, but they remain within an intensity range which will continue to train a targeted motor quality or strength. This is an excellent way to avoid accommodation and stagnation. It would be impossible in one article to cover every sports training method to combat accommodation and stagnation. What is possible, however, is to come up with a set of parameters to use to discover what areas must be addressed. How many times has this exercise been repeated in this manner? How many total exercise variations are being utilized? What strengths or motor skills are not being trained sufficiently? Is the sport more heavily reliant on strength, or speed? Like a cake that must have certain ingredients in optimal quantities, when a mass must be moved, absolute strength, explosive strength and speed strength must be present and involved to a greater a lesser degree in optimal quantities. The proof is now in the performance. If it increases, that is a good indicator that the changes are working. If performance stalls out again later down the road, the coach or athlete can go back to the drawing board to figure out more solutions. The process can be repeated for any activity. Identifying dominant strengths and support strengths in a sport activity will go a long way to being able to identify and eliminate weak links. It has been said already – every drill or exercise has a lifecycle to it. Along the same lines, it is often what is not being trained that will hold performance back. To teach the brain and body to adapt further requires learning increasingly complex motor skills. Make adaptation your friend – let it work for you, not against you. Will Vatcher is a strength & conditioning coach based in Cambridgeshire, England. He has written several articles on training for www.t-nation.com & www.about-muscle.com, and published interviews with Louie Simmons & Fred Hatfield (Dr. Squat) which are posted on about-muscle. He is a very enthusiastic researcher of all things strength, speed and sports related. He can be contacted via email willvatcher@hotmail.com for information on articles and training. This is completely off topic but can you advise of the best way to build/train calves? Great article. I like your approach of starting with research and carrying it through to application. I always wonder in these studies (which are inherently fairly short term compared to an athlete’s training horizon) how much of the accommodation is neurological as opposed to what most people assume is muscular. Anyway, great piece. Thanks so much for sharing. Thanks Will!! This was very helpful, especially since I have a sled. Just make sure u have a balanced lower body routine including squat, deadlift, oblique, hip flexor/front abs and calf work. During a warm-up I would do some kind of horizontal jumping(drop jumps & broad jumps or long and short bounds) as well to really work horizontal plane hip power. Always use multiple rep ranges during a week if poss. Hi Bret! First congrats on your book Strong Curves, I’m currently doing the Glute godess workouts and I’m loving it. I’ve been lifting one year now, and yesterday I remembered that when I was a child doctors found a little deviation on my spine. Nothing too big, because never needed special control, unlike my brother, whom scoliosis was more severe (around 40 plus degrees him. Mine is less than 20), but enough for my left hip being about 1 cm lower than the right, so my left leg is about 1 cm longer than the right. The thing is I never think about it and never thought it could be anything wrong with weighlifting until yesterday, when I remembered it and comment in the gym. They told me I shouldn’t do squats and dead lifts. I’m really concerned, and those exercises are my absolute favorites and never experienced any pain out of the stifness in the back from doing them. I’m a girl, 31 years old, squatting and dead lifting about 120 lbs. Can I keep going or should I stop? Please, if you can answer me it would mean a lot. I’m very concerned and lost. Thank you very much. 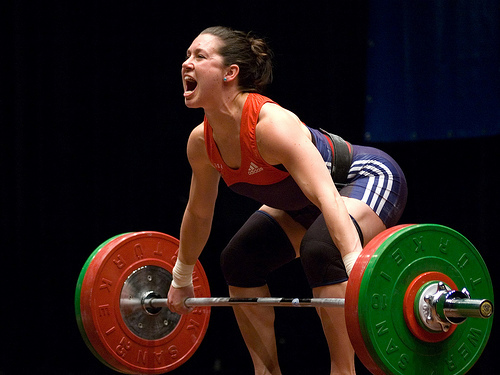 In the article when referring to absolute strength and maximal strength. Are you referring to the definitions that are used in supertraining ? or just using the two words interchangeably? Ahh cool, where u based?